Researchers at Princeton University have discovered that the climate models which are used by scientists to project future conditions on Earth underestimate the cooling effect of daily, and even hourly, cloud cycle over land. According to the researchers, too much of the sun's daily heat is accounted by those climate models, ultimately resulting in warmer and drier conditions than might really occur. The study was reported in the journal, Nature Communications (Dec. 22). The team discovered that while inaccuracies in factoring the daily, or diurnal, cloud cycle did not appear to invalidate climate projections, it did increase the margin of error for a vital tool which researchers used to interpret the effect of climate change on humans. "It's important to get the right result for the right reason," said corresponding author Amilcare Porporato, a professor of civil and environmental engineering and the Princeton Environmental Institute. "These errors can trickle down into other changes, such as projecting fewer and weaker storms. We hope that our results are useful for improving how clouds are modeled, which would improve the calibration of climate models and make the results much more reliable." First author Jun Yin, a postdoctoral research associate in civil and environmental engineering, and Porporato discovered that inaccuracies in accounting for the daily cloud cycle has the sun bombarding the planet with an additional 1-2 watts of energy per square meter. Moreover, the increased amounts of carbon dioxide gas in the atmosphere since the beginning of the Industrial Age are estimated to create an additional 3.7 watts of energy per square meter. "The error here is half of that, so in that sense it becomes substantial," Porporato said. Porporato and Yin attended a seminar on cloud coverage and climate sensitivity before undertaking their study. "The speaker talked a lot about where the clouds are, but not when," Yin said. "We thought the timing was just as important and we were surprised to find there were fewer studies on that." Clouds change from day-to-day and during the day. According to Yin, while climate models do an excellent job of capturing the average cloud coverage, they tend to miss significant peaks in actual cloud coverage. However, these peaks can have a major impact on everyday conditions, for example in the early afternoon during the sunniest part of the day. "Climate scientists have the clouds, but they miss the timing," Porporato said. "There's a strong sensitivity between the daily cloud cycle and temperature. It's like a person putting on a blanket at night or using a parasol during the day. If you miss that, it makes a huge difference." Using satellite images from 1986-2005, the researchers calculated the clouds’ average diurnal cycles in each season across the globe. Yin inspected the cloud coverage at three-hour intervals, looking at over 6,000 points on the Earth measuring 175 miles by 175 miles each. Porporato and Yin came up with the averages which they compared with those from nine climate models utilized by climate scientists. They observed that most of the models have the thickest coverage that occurs in the morning over the land instead of in the early afternoon when clouds protect the planet from the sun's most intense heat. "A small difference in timing can have a big radiative impact," Yin said. The team intends to study how different types of clouds have an effect on climate-model projections, and how cloud cycles affect the year-to-year variation of Earth's temperature, particularly with respect to extreme rainfall. Gabriel Katul, professor of hydrology and micrometeorology at Duke University, added that "the significance is quite high" of precisely modeling the daily cloud cycle. While Katul was not part of the research, he is familiar with it. According to him, the cloud cycle can point to deficiencies in the characterization of atmospheric water vapor and surface heating, both of which are required for cloud formation. In addition, both factors control how the atmospheric boundary layer– the lowest portion of Earth's atmosphere – interacts with the surface of the planet. "The modeling of boundary-layer growth and collapse is fraught with difficulties because it involves complex processes that must be overly simplified in climate models," Katul said. "So, exploring the timing of cloud formation and cloud thickness is significant at the diurnal scale precisely because those timescales are the most relevant to boundary-layer dynamics and surface-atmosphere heat and water-vapor exchange." Katul informed that where clouds are concerned, climate models have usually focused on spatial areas, mechanisms, and timescales – for example hundreds of square kilometers, microphysics and air pollution, and seasons, respectively – that are more generalized and larger. "There are practical reasons why data-model comparisons were conducted in a manner that masked the diurnal variation in clouds," he said. "Diurnal variation was somewhat masked by the fact that much of the climate-model performance was reported over longer-term and larger-scale averages." However, by capturing the thickness and timing of the daily cloud cycle on a global scale, Porporato and Yin have given climate scientists a tool for validating whether climate models correctly represent the interaction between clouds and the atmosphere as well as cloud formation. The global coverage and emphasis on both 'timing' and 'amount' are notable. As far as I am aware, this is the first study to explore this manifold of models in such a coherent way. I am sure this type of work will offer new perspectives to improve the representation of clouds. I would not be surprised to see this paper highly cited in future IPCC [U.N. Intergovernmental Panel on Climate Change] reports. 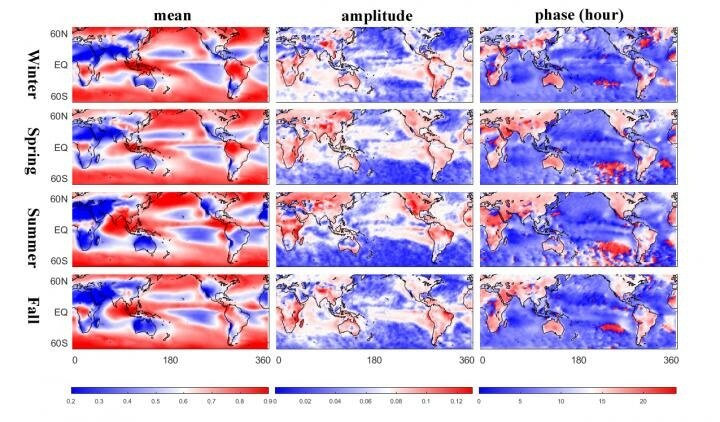 The paper, "Diurnal cloud cycle biases in climate models," was published online Dec. 22 by Nature Communications. The National Science Foundation (grant nos. EAR-1331846, EAR-1316258 and EAR-1338694), the Duke University Wireless Intelligent Sensor Networks (WISeNet) program (grant no. DGE-1068871) and the U.S. Department of Agriculture's Agricultural Research Service (no. 58-6408-3-027) supported the research.